1: The legislation draws a new coverage formula for Section 4, thereby resurrecting Section 5. States with five violations of federal law to their voting changes over the past fifteen years will have to submit future election changes for federal approval. This new formula would currently apply to Georgia, Louisiana, Mississippi and Texas. Local jurisdictions would be covered if they commit three or more violations or have one violation and “persistent, extremely low minority turnout” over the past fifteen years. [R]ulings against voter ID laws–like in Texas in 2012–will not count as a new violation. Voter ID laws can still be blocked by the Department of Justice or federal courts in the new states covered under Section 4, but that will not be included as one of the five violations needed to keep the state covered. This exemption for voter ID laws was written to win the support of House majority leader Eric Cantor and other Republicans. 4: The legislation makes it easier to seek a preliminary injunction against a potentially discriminatory voting law. Plaintiffs will now only have to show that the hardship to them outweighs the hardship to the state if a law is blocked in court pending a full trial. There will be a preliminary injunction hearing on North Carolina’s voting law in July 2014, before the full trial takes place July 2015. 5: The legislation reaffirms that the attorney general can send federal observers to monitor elections in states subject to Section 4 and expands the AG’s authority to send observers to jurisdictions with a history of discriminating against language minority groups, which includes parts of twenty-five states. This proposed bill – which will be introduced in both houses – is the latest effort to revise (and revive) the VRA in the wake of Shelby County. Prospects for passage are mixed; while there appears to be some bipartisan House support, it is not yet a sure thing and at introduction the Senate version had no Republican original co-sponsors. Still, the initial draft of the bill does reflect an effort at compromise between the parties (as evidenced by the exclusion of voter ID cases from triggering events) as well as an attempt to resolve the constitutional issues identified by the Court last summer. It will be interesting to see if the political environment has changed on issues like this. For whatever reason, voting rights legislation has enjoyed overwhelming support in Congress, at least recently; what’s unclear is whether the Shelby case has given opponents of the VRA sufficient cover to vote against efforts to expand it. This is, undoubtedly, a big deal. Stay tuned. Next: Pennsylvania Judge Strikes Down State’s Voter ID Law – Now What? 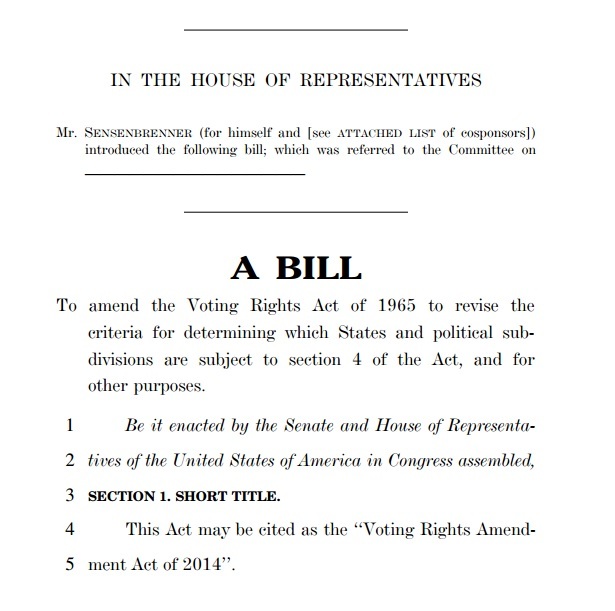 Be the first to comment on "The “Voting Rights Act Amendment” Introduced in Congress"